With summer in full swing and daytime temperatures in crazy high ranges it’s exactly the right time for something sweet, healthy and frozen to help cool you down. Traditional ice cream/cones are high in calories and fat. But you don’t have to give up good nutrition to enjoy a cold refreshing treat. 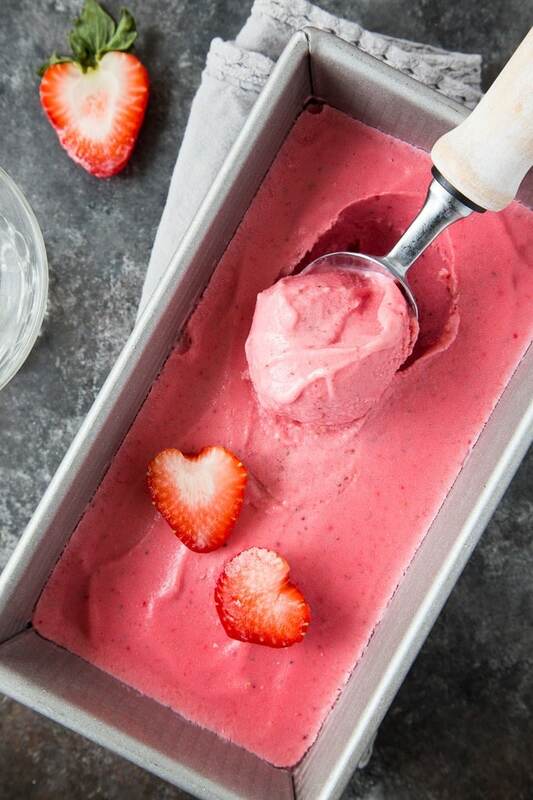 This Strawberry Frozen yogurt is a perfect healthy, clean-eating summertime treat. Only 4 ingredients (fresh/frozen strawberries, Greek yogurt, honey and lemon juice) needed. No churning or fancy ice cream makers required, only a blender (or food processor). 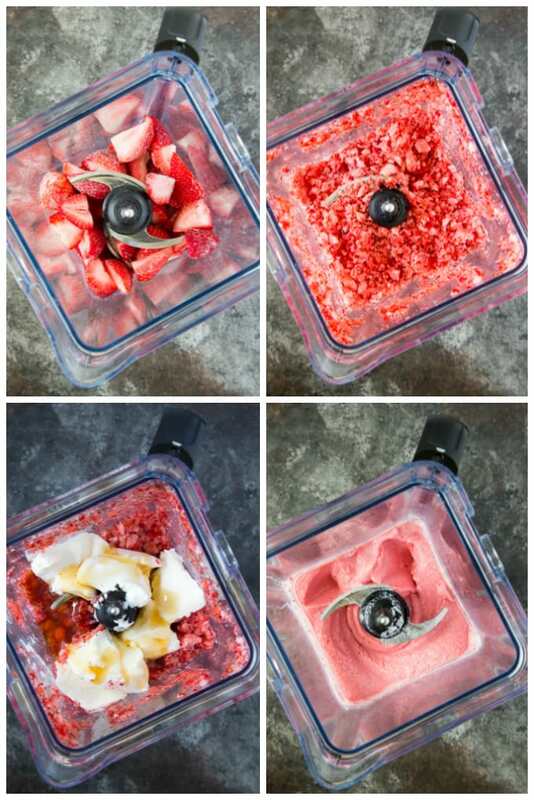 Place frozen strawberries in a blender ( or food processor) and pulse until strawberries are rough chopped. Add Greek yogurt, honey and lemon juice and continue blending/processing until mixture is creamy ( about 2-3 minutes). Transfer mixture to a freezer- safe container, cover and allow to freeze for a minimum of 6 hours. Recipe Tip: When freezing yogurt it’s preferable to have an airtight freezer-safe container with a lid. If you don’t have one with a lid then use a layer of plastic wrap followed by a layer of aluminum foil to cover the yogurt, this will help keep any ice crystals from forming on the yogurt (keeping it nice and smooth and delicious). Do you love sundaes? Me too! 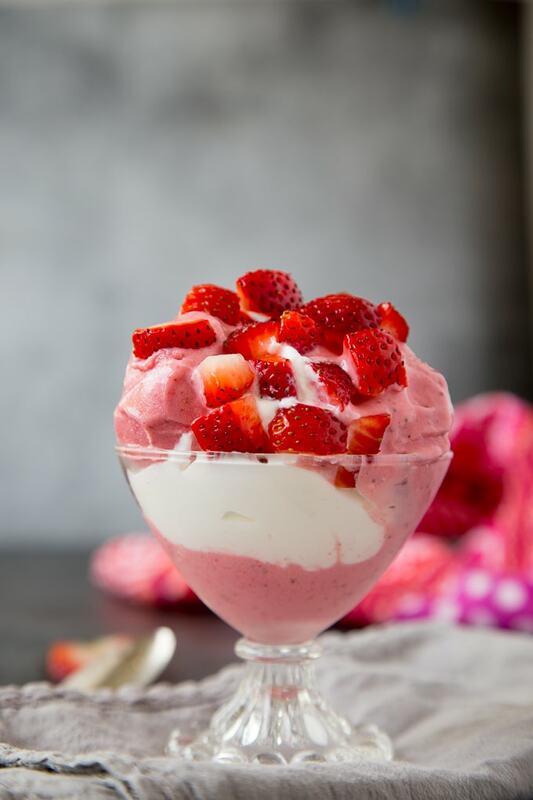 Try adding Honey Yogurt “Cream” and sliced strawberries to this Strawberry frozen yogurt for an even more decadent (but still totally healthy) twist. What is Honey yogurt “cream” ? By combining Greek yogurt and honey and a splash of water you’ll have a creamy healthier alternative to heavy cream. Higher in protein and lower in fat it’s a great way to get that “strawberries and cream” flavor. With a few simple swaps (same quantities as original recipe) you can make this recipe completely plant-based. Swap in Almond Milk yogurt (or your favorite non-dairy plain or vanilla yogurt) instead of traditional Greek yogurt . Kite Hill brand makes a great Greek style almond milk yogurt. Also, swap in agave instead of honey for both the frozen yogurt and the yogurt “cream”. Place frozen strawberries in a food processor or blender and pulse until strawberries are rough chopped. Add Greek yogurt, honey and lemon juice and continue blending/processing until creamy (about 2-3 minutes). Transfer to a freezer-safe container and freeze for a minimum of 6 hours. Whisk ¼ cup Greek yogurt and 1 Tbsp honey together. Add a small amount of water to thin yogurt to a thick cream consistency. ( I used about 2 tsps. but this will vary depending on the brand of yogurt you are using, some are much thicker than others). Serve Frozen yogurt and top with "cream" and sliced strawberries for garnish. * You can use fresh strawberries for this recipe. Clean strawberries and cut in half. Freeze for at least 2 hours prior to making Frozen yogurt.